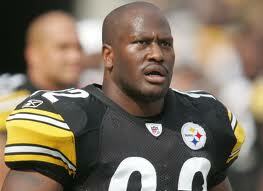 Fans of Steelers LB James Harrison should brace themselves, it sounds like the fiery hitter will not be back in the Steel City in 2013. Reports from Ed Bouchette of the Post-Gazette states that the Steelers are inching closer to releasing Harrison as the team and his agent can’t come to terms on a lesser deal. Bouchette says that the talks are “at an impasse,” and there’s a good chance that the five-time Pro Bowl LB will be released. Harrison is set to make $6.57 million this season, and right now for a Steelers team that is still very much over the cap, it’s a number they can’t afford. The agent for Harrison says the LB wants to stay with the Steelers, but if he and Harrison don’t budge, he won’t ba around much longer. 4 Comments on "Reports Say James Harrison Close To Being Released"
Make a deal Guys we need Him !!!! Goodbye Harrison. His interception td in sb 43 might be the most exciting play I’ve ever seen. Steelers.com reported –as of 1:05 PM– that Harrison has been released. Its a shame because he is one of my all-time favorite players, and in my opinion one of the top linebackers in team history. But all good things must come to an end, and recent injuries have really taken their toll on him and his production and effectiveness have suffered greatly. That and his unwillingness to take a pay cut are the factors which made this move necessary. Thanks for the memories Silverback, it won’t be long before he joins guys like Kordell Stewart, Joey Porter, Willie Parker et al and comes back to retire a Steeler.